Sunrise, settling back, coffee and muffin in hand. Opening up the newspaper. Nothing like a morning flight. Then I heard the short snapping sound and men were walking through the cabin. "Okay, everyone: Out now into the buses. 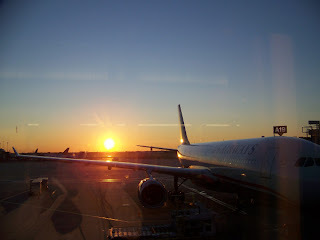 You'll be in Philadelphia in six or seven hours, you'll awake there, and remember nothing." Only this time I did remember. Every word. "Charge 'em for airplanes, pay for buses, we make a bundle!" said one man. "Good thing no one ever expects the .... aeroplanes! .... to be on time." "Air travel, ha!" laughed the other. "Why, humankind is still 200 years away from air travel!" Picture prompt above, story below, and I nailed it at 105 words, which is close enough to the designated 100 word limit to get me off the ground and into the air flying, thank you very much! This is my weekly contribution to the Fabulous Friday Fictioneers and Flying Circus for this Friday, February 8, 2013. Now please click the link and fly on over to the other high flyin' contributors, making sure to bypass any lurking buses. Man may not have been meant to fly, but he (or she) sure was meant to blog! That was a twisted, crazy story. You had me going back and forth to be sure I'd gotten it. Nice start to my morning, which is about to get much busier! Thanks for the fun, but slow, ride. There's a well known budget airline over here in the UK that charge for everything they can possibly think of in order to make a buck. Charge you for checking in, printing out boarding passes, measure your bags to the nth dimension to see if an additional charge can be slapped on. They were even hoping to charge for toilet visits I hear. I hope to God the Chairman of this company isn't reading this or we're all sunk. You should patent this idea - he'll snaffle it. So original Perry, really funny. How do you do it? Well done. Thanks, Janet. Sounds like your morning is nothing like a morning flight! I hope he does snaffle it because then I can find out what "snaffle" means. Thanks, Sandra! Hope all is well in the land of Richard III. wow this is delightfully different. crazy story but of course, you pulled it off. this may sound like an odd comment but i'm curious as to why you chose philadelphia. I live there, and it saved four words over "The Duchy of Grand Fenwick." Not me. It's 'The Conspiracy to Make Us Think There are Such Things as Airplanes so They Can Charge Us for Them' that pulled it off. Buses? What's that? We travel by mule down here, but boy you should see the baggage charge they add on. Once, on a flight up to Joplin they stopped twice to change the mule's shoes. What a hoax! Everyone knows they wear army boots-not shoes. sometimes I think the bus would be faster! What was in that coffee and muffin? Good Job! Enjoyed reading that one. I'm afraid I'm 200 years away from "Good one!" I hate to break it to you, Russell, but mule travel is a myth too. And I'm getting sick and tired of pulling that little wagon with you in it all the time! Thank you for your lingering LOL. Exactly why nobody bothers to invent planes! I'm sure it was a guy sitting with his muffin and coffee one day not going anywhere who thunk it all up. I don't know, Shirley, but it caused me to invent air travel. I hope they have one of those places in the bus terminal in Philadelphia! Thanks. Glad you decided to fly me! I am starting to think this is all made up! No, Tom, every one of my stories is based on documented fact. Certificates are on file in the office. I love it! My kind of story, all the way. :D What do you suppose those guys really look like behind the mask? They are wearing masks, aren't they? Humankind - snort! Hah! Science faction. I loved the idea of this, I really thought you were going down the terrorist attack route, so it was a surprise. This mouse is roaring...with laughter. Does this mean that after I read your story I won't remember anything? I once traveled from KC to NYC by bus. I was ten at the time and I still remember feeling hazed by the end of the trip. I think I'll take Russell's mule cart. Man smart enough to write a twisted tale like you did ough to be able to handle the jump to light speed and WordPress. Get hot while I wade through the BS to tell you I liked your writing this week. I would guess they are wearing masks. They'd have to be ugly people to be scamming us like this! Thanks for writing, Debra. Yes, I could have gone down the old terrorist attack route but then I'd have to heroically rescue everyone, and I was too comfortable with my muffin and coffee. Next time. Thanks. I always try to be good. No, you will remember but you will think it is a work of fiction. Remember all those lousy meals and crying babies you seem to remember from flights past? Dreamed up in the board rooms of "airplane" corporations. In real life, you were in Russell's mule cart. Thanks, Douglas. And about space travel? William Shatner is wholly in charge of the special effects required to make us think there is space travel. In reality, we've never gotten higher than Albany through "space travel." Not British tricksters. Just tricksters using the preferred spelling for the projected flying machines once they are actually built. The rather more brittle term "airplanes" is simply slang of the moment. I loved your spin on this! Ah the subterfuge the airlines rain down on us and how we allow it. We are left to curse their ways, but ultimately act as sheep and follow their directions. You doubt me? Tell me: ever had any good food on an airplane? Landed on time? Joined the mile high club? Don't you think at least one of these things would have happened if there really were such a thing as air travel??? If I had thought of that sentence, I could have bagged the whole story! The pontoon buses? Oldest trick in the book! Thank your, Boomie. And have a nice flight! You are crazy but in a good way. I agree with both of Beth's comments. Very quirky, great little story. Thank you. Glad I made your flight that little bit more comfortable!